Substantially industrialized rivers can hold a lot of secrets. Sometimes they're regrettable, in the form of pollution and blight that take decades and millions of dollars to remove. Other times, they reveal a more romantic past, with activities you can barely imagine the area could support today. We recently got a lead on one of these stories from reader Greg Parson, who commented on our story about New Jersey Aviation Hall of Famer Ed Gorski and the Lincoln Park Airport. Among his reminiscences about Gorski and the field, he mentioned that his uncle, George Lambros, had operated a seaplane base in Little Ferry. A seaplane base? On the Hackensack River? With our friends from Hackensack Riverkeeper, we'd cruised up the river in August, enjoying the rebirth of the Meadowlands punctuated with occasional stories of past and present commerce on the river, but I couldn't recall hearing anything about aircraft. Had I missed something? Indeed, when I mentioned it to friends on Facebook, several confirmed that two bases were operational at the location at some point in the past 40 years. One friend even noted that she used to watch the takeoffs when she was growing up in Ridgefield. Greg kindly got back to me with some additional information, including an address and the observation that the current Little Ferry Seaplane Base is actually across the river from the original Lambros property, which was in Ridgefield Park. The Little Ferry location had once been the home to a famed restaurant called Tracey's Nine Mile House, which apparently served an amazing sliced steak sandwich. or Runway 01-19 of Little Ferry Seaplane Base. With that information in hand, I took to the web for additional background. While there's not a lot of data out there on George Lambros or his operation, I did discover that the base opened in August, 1947 as an adjunct of sorts to nearby Teterboro Airport. Lambros operated an instructional school and seaplane rental out of the base, using craft like the Grumman Wigeon to certify pilots for water takeoffs and landings. Among those giving the lessons was Springfield resident Kathleen Hilbrandt, who'd received her flight instructor rating after serving in the Women Airforce Service Pilots during World War II. 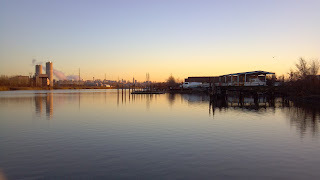 Lambros didn't have a monopoly on that stretch of the Hackensack, with Mellor-Howard Seaplane Base operating nearby. The Hackensack Riverkeeper himself, Bill Sheehan, also informed us that another seaplane port operated farther upriver, at Carlstadt. Now the site of River Barge Park and Marina, the former Sky Harbor was also a training location for water-heading pilots during World War II. Look for more recent information about the Little Ferry operation, and you're up for a difficult search, especially if you attempt to find the seaplane base itself. At least two owners have operated the base since Lambros, but I couldn't find the date when it moved across the river from Ridgefield Park to Little Ferry. Several sources, including the Federal Aviation Administration website, list it as an active base, with two operations reported in 2012 (I'm assuming that's one landing and one takeoff, but I could be wrong). However, when Ivan and I visited the site recently, all we could find was a closed restaurant (perhaps the successor to Tracey's), a dock that appears to have seen better days, and no evidence of aircraft whatsoever. To be fair, the area was hit hard by Hurricane Sandy. Across the river, the former site of the Lambros base is occupied by a large industrial building. Needless to say, we'll be doing a bit more research on this fascinating aspect of the Hackensack River. Meanwhile, if you're in the area and see an amphibious airplane coming in for a landing, let us know! When I was a kid I actually flew on one of the seaplanes from the Little Ferry base. When I worked in Little Ferry area in the mid 70's the base was still there. I remember the seaplane base as well as Tracy's. Once when I was a kid I was on the River most of the day. I went from Paterson Plank Road to Route 4 and back and I needed gas for my 7 1/2 Evinrude to get back to Paterson Plank Road. I stopped to get gas at the base so I could return the rented rowboat to the outfit at the end of Paterson Plank Road. It started to rain and the people at the base were worried about me being on the river in the downpoar. So they flew a couple of passes overhead to make sure I made it okay. They were a class act. In 1983 I was taking lessons at the seaplane base. I got my single engine sea and later went on to get my single engine land later that year. the seaplane base was active when i was a living in little ferry from 1969 t0 1981. my friends and i flew in them on summer days when we were looking for something fun and different to do... and when we had $25.00. ( i think this was the price for however many could fit safely. One up front and three squeezed into the back seat, which was smaller than a V.W. Beetle back seat. We would be pushed off away from the dock, fly out over the newark?bay and over N.Y.C. and the Statue of Liberty. It was a fast but fun trip and the pilot would sometimes fly under the little ferry- ridgefield park bridge. Sometimes we had to circle because of river boat traffic. P.G. I received my single engine sea rating in 1967 at Little Ferry, from Lou Hasselbeck who ran the base at that time. Lou got killed in a Cherokee at Eagles Nest Airport in Manahawkin a few years later. My father occasionally flew charters for George Lambros when he first began operations and was an instructor at Mellor-Howard Seaplane Base which was across from what is now the powerhouse adjacent to the TP, when he returned from the ETO flying P-47's and before he went to work for Colonial Air Lines later absorbed by Eastern. I have numerous pictures and stories of the life of the "river rats". Mellor-Howard was the largest CPT flying school in the country just after the war...another little known or remembered fact.Sorry I just saw this. Oh and I forgot....Tracey's Nine Mile House was legendary. The sliced steak sandwich was nothing short of amazing along with their string french fries. I think Andy Gargas was the last proprietor though I could be mistaken. In any case, he poured a marvelous adult beverage. I took many dates there in my "lost years"! incidentally, since the format below doesn't allow for it, my email is: rick@recycledpilots.com should anyone wish to hear the "rest of the story". The New Jersey State Teachers College at Jersey City operated a Civilian Pilot Training Program (CPTP) in 1940 to 1943 at the Mellor-Howard Seaplane Base, Ridgefield Park, NJ. They trained pilots for wartime service. Rick, Lou Hasselbeck crashed returning to the Manahawkin Airport just off Hwy 72. He crashed into the trees just short of the runway. My father and I used to work with him after he purchased the that airport. Eagles Nest is a little farther south near Stafford Forge. Thank you though for the trip down memory lane and Lou's name I've been racking my brain over that one. I took my first lessons out of Manahawkin Airport in 1969 shortly after Lou bought it and reopened it. In the early or mid 70s I kept a Cessna 180 on floats in a new hanger that was built on George Lambros' base in Ridgefield Park across from the Little Ferry base. The hanger also housed a twin Otter that was used for passenger service from NYC to Philadelphia and also a Jet Ranger used for NBC News.